In the logistics chains big bags are a cost-effective alternative to conventional bags. They are available in different designs, e. g. with internal stiffing for better stability. 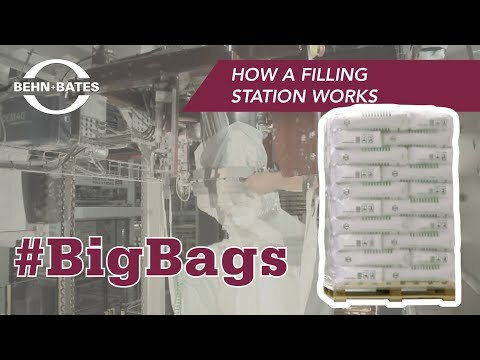 But what all of them have in common is that they must allow quick and clean processing - goals that can be easily reached with our big bag filling station GWH. For the smooth processing of your big bags we offer different machine variants allowing to fill powders & flours as reliably as grains & granules. Furthermore our delivery programme includes a large variety of accessories, e. g. automatic pallet separator, cover sheet dispenser or full pallet transport systems. You specify the degree of automation - we supply you with the equipment you need. Special requirements apply for filling big bags under cleanroom conditions. In order to assure that no forbidden materials such as wooden pallets get into the cleanroom we have developed a special shuttle system. After filling it takes over the big bag, transports it out of the cleanroom and puts it onto a pallet for further processing - and all this to comply with the required hygiene standards.